Holy Cow! No body was injured. station. Updated by Mr.呂國寶 on his FB page that the driver was in the van when it happened. Fortunately, he wasn't injured by the falling rock but he was stunned by the rock. THSR will run its schedule at every 00/20/40 and stops at every station. For tomorrow schedule will be announced before 7 PM. Typhoon Soala made its first landfall in Hualien County at 3:30 am. After making a circle, it entered the Pacific Ocean again. TCWB predicts it might make another landfall. 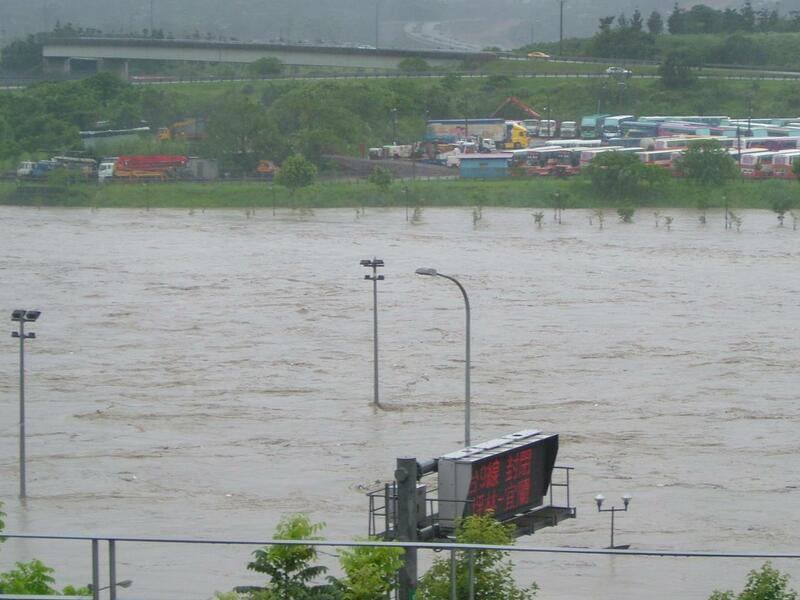 This picture of Xindian River was taken and posted on FB of Professor Khîn-huānn Lí around 8:30 am. The bad news is the high tide will be at 10:30 am and 23 pm which means the rivers will be overflown in Taipei. So it is extremely dangerous for people to close to river areas. Taiwan Railroad: All schedule before noon are canceled. Taiwan Railroad service will be normal until 18:00. High Speed Rail schedule is normal. Some Airline Schedules are canceled. 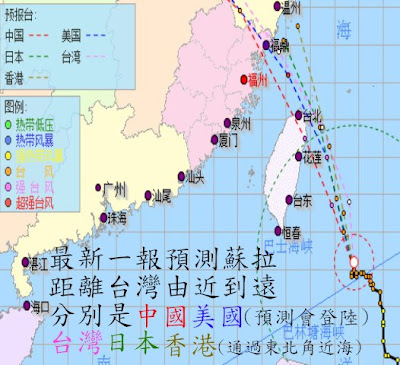 TCWB predicts rainfall would reach 1,500 mm (1 meter) in northern part of Taiwan from Aug 1-3. Typhoon Saola is expected to strike Taiwan, starting on the east coast. 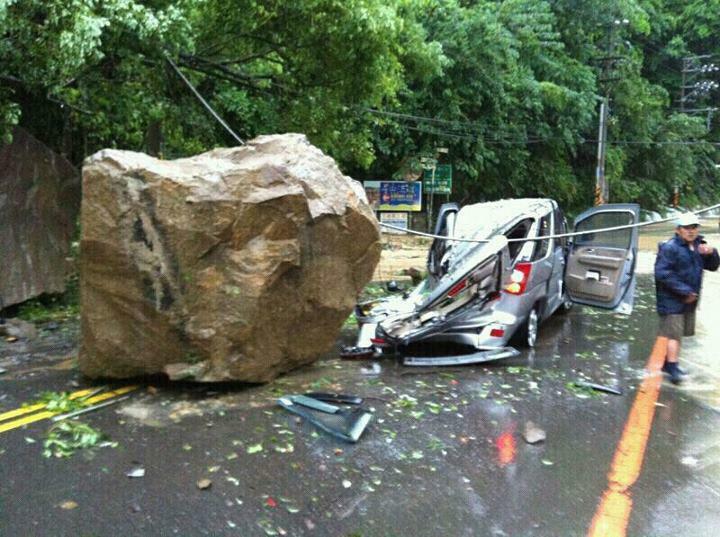 Taiwan Central Weather Bureau will possibly announce Land Warning on Tuesday afternoon of July 31. TCWB suggest people on the northeast coast and east coast of Taiwan to be cautious and don't go to beaches or nearby the sea. All schedules to Orchid Island and Green Island have been canceled at this time. More info please visit: http://www.cwb.gov.tw/V7e/prevent/typhoon/ty.htm? 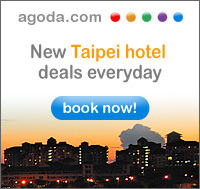 most effective on Taiwan is between August 1-3. Soala will pass by the northeast coast.